The town of Wolf Creek is assaulted by a small army of former Confederate guerrillas, who rob the bank and leave dead innocents in their wake. Sheriff G.W. 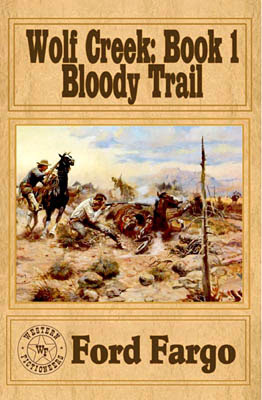 Satterlee and his posse must overtake the outlaws before they reach Indian Territory but the chase is complicated by the secret pasts of several posse members. As most will know Western Fictioneers is an organisation made up of published western writers and this series is a group effort. Each author writes from the perspective of his or her own unique character, blended together into a single novel. Appearing as Ford Fargo in this volume: Clay More, James J. Griffin, Troy D. Smith, James Reasoner, L. J. Martin, & Cheryl Pierson. Before beginning this book I did wonder whether it would flow together or seem like a number of short stories told by different authors about the same place and characters. Yes, the different writers styles are evident but the plot has been carefully thought out and each authors’ work joins together seamlessly. Authors have two chapters in which to tell their part of the tale. A couple use one of them to flesh out the background of their characters, and Clay More, who opens the book, also explains the history of Wolf Creek. Clay More’s second chapter then moves up a gear in the action stakes as the town is attacked and you have to wonder if there will be anyone left alive by the end of chapter two. The story then becomes a chase tale but this is complicated by the secrets of the posse members and animosities due to some having ridden for opposite sides during the Civil War. Some of the authors resolve these problems and reveal the secrets, others hint at them and leave things hanging for further novels. And talking of the next books, I’ve been informed that book 2 is almost ready to be published, and books 3 and 4 are in development. On the strength of Bloody Trail I for one am eagerly looking forward to discovering the fates of the people of Wolf Creek. If you’d like to find out more about the authors, their characters, and the town of Wolf Creek then you can do so here. Thanks, Steve! I'm so glad you enjoyed it. This was a lot of fun to work on.